Dr. Laura K. Marsh, PhD, Global Conservation Institute [USA]. Laura grew up in southern California bird watching with her dad from the age of two. At 18, she stepped into a rainforest for the first time as a volunteer on a primate study. 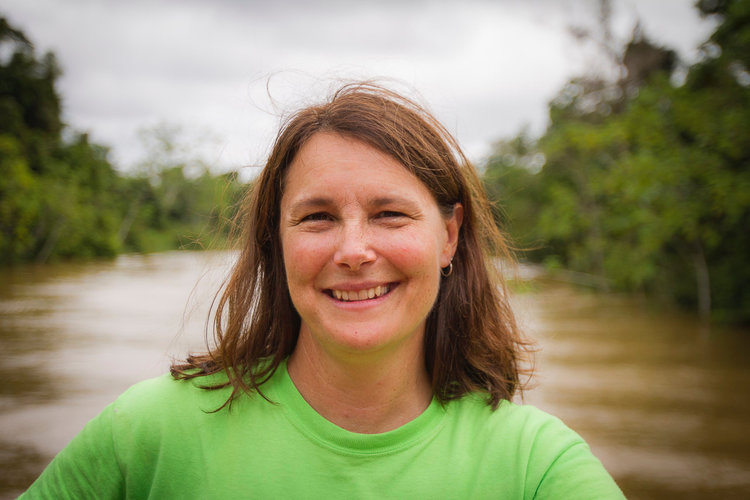 This experience led her to create one of the first K-12 curriculums on tropical rainforests. Many years later as a post-doc, she was invited to confirm the primates at Tiputini Biodiversity Station in Ecuador. As she was scanning the canopy for primates, she suddenly noticed a monkey calmly looking down at her from a nearby branch over the trail. She later identified it as an undescribed saki monkey. The experience led her to rewrite the saki monkey taxonomy, becoming the world’s leading expert in Pithecia, and to create and lead the Houseboat Amazon Expedition. She serves as a cautionary tale to the rest of the HBA team. After hearing her stories about getting leishmaniasis in Belize, hemorrhagic dengue from mosquitos in Peru, and hookworm from a tapir (just to name a few), the team was all disciplined about wearing repellent and long sleeves to the field! Felipe Ennes Silva, MS, Mamirauá Institute [Brazil]. Felipe is from outside of Porto Alegre in Rio Grande do Sul, Brazil where he spent his childhood fishing and roaming the forests of the countryside. In college, his love of nature turned into a love of primates when he worked with a student group called Macacos Urbanos (Urban Monkeys) to map the distribution of howler monkeys near the city and advocate for their protection. He learned to do pure research under his graduate advisor, professor Bicca-Marques, but he still prefers the research-activist approach he learned with Macacos Urbanos. He met Laura in 2005 as an undergraduate student when she visited his field project. In 2012 he began organizing expeditions to the Aripuana River to survey primate populations with a focus on marmosets. He is currently working on his PhD on the taxonomy, distribution, and conservation of bald-headed Uakaris. He joined the expedition as a field researcher and provider of nighttime entertainment by swinging a bug zapping tennis racket while singing the theme of Highlander. Lisely Lemos, BA, Mamirauá Institute [Brazil]. Lisley grew up in Betim, a small town outside of Belo Horizonte in Minas Gerais, Brazil. As a child, she was afraid of everything, including the forest and bugs. Later in life, she saw this as a challenge to overcome and pursued a degree in biology. As an undergraduate, Lisley studied the vocal communication of four primate species in the Atlantic forest in south Minas Gerais. Having learned of Mamirauá Institute and the work of Márcio Ayers, she realized her dream to work there when she received a scholarship to study the effect of hunting practices on primate populations in Mamirauá. She met Laura on her first reconnaissance trip to the Amazon for the HBA expedition in May 2016 and quickly became an invaluable organizer of the trip. She served as the houseboat manager and one of the field researchers. Alejandra Duarte, MS [Mexico]. Ale is a Lecturer at National School of Anthropology and History in Mexico City. As a child she was inspired by Indiana Jones to become a field archaeologist. She found her way into primatology through Physical Anthropology. Alejandra was a mentee of Laura’s at the 2010 International Primatology Conference in Japan. She looks forward to bringing the knowledge and field experience she gained through this expedition back home to share with her students. Alejandra’s unique role on the expedition was to work with the communities along the rivers to better understand how they use their resources. The local knowledge she collected informed the team about how monkey populations are impacted by hunting and other practices. Anamélia de Souza Jesus, MS, Mamirauá Institute [Brazil]. Anamélia is a biologist and received her masters degree in zoology from the Faculty of Biosciences of the Pontifical Catholic University of Rio Grande do Sul. Since graduation, she has been involved in research with non-human primates. She also worked with several species in captivity. Her experience is mainly focused on the behavior and conservation of howler monkeys (Alouatta spp. ), also called guaribas. For her master's degree she studied diet and parasitic load of black-and-gold howler monkeys. After completing the study, she participated in the Muriqui de Caratinga Project for two years, collecting data on the demography and behavior of two groups of northern-muriquis. In 2016 she began working in the Terrestrial Vertebrate Ecology Research Group at Mamirauá Institute, where she is developing the study of the sustainability of hunting howler monkeys. Anamélia assisted in the early logistical planning of the expedition and the translation of texts and documents. Her participation during the expedition was as a researcher conducting surveys. Alessandro Rocha, MS [Brazil]. Alessandro was born in Campinas and grew up in São Paulo. His first contact with nature was in the fazenda region where, as a child, he attended family traditional festas, enjoyed hiking for bird watching, and went fishing with his grandfather. Unfortunately, monkeys were gone from the area due to deforestation. He received an MSc in ecology and is currently looking forward to undertaking a PhD in primate conservation assessing the occurrence of primates according to landscape ecology, considering the topographic changes in eastern Brazil. He became interested in joining the expedition as he followed the Houseboat Amazon Facebook posts and was encouraged and supported by his parents and girlfriend to join. He was involved with data collection and provided his expertise in igapó surveys. He was able to observe species he had not seen before in the wild and wanted to gain experience on how to run future expeditions of this kind to enhance current knowledge of biodiversity in his country. He learned about local knowledge as an important component in conversation action plans. Uacaris and titi monkeys are his favorite primate species, and he loves relating the landscape features to their presence or absence. Karine Galisteo Dimer Lopes, MS [Brazil]. Karine was born and raised in the city of Porto Alegre, Brazil. As a child, she was afraid of bugs and spiders, but her father was fascinated with trail adventures and animals, so he always encouraged her to be in touch with nature and to enjoy its uniqueness. She received an MSc in zoology and is looking forward to developing a PhD research project in the Amazon. She attended the International Primatological Conference in Chicago (2016), where she got to know the purpose of the expedition and applied to become part of the team. She undertook surveys in terra firme, igapó and várzea. She loved the expedition and learned so much from the new field experience. Squirrel monkeys are her preferred species along with the titi monkeys she has studied before. She enjoyed being inside the flooded forest where it was so calm and quiet. Gerardo Alberto Rivero Gonzalez, Student [Mexico]. Gerardo was born in Mexico City where he just finished his undergrad classes in physical anthropology and now will do his undergraduate thesis. As a child, he lived in the north of Mexico surrounded by desert where the extreme conditions made it hard to be in touch with nature. However, his family occasionally rescued animals and raised them at home, where he had the chance to observe them closely. Becoming part of the Houseboat Amazon team gave him the opportunity to learn about different methodologies used to collect data systematically and in different field conditions, as well as a chance to experience how multidisciplinary and multicultural expeditions come together. On this expedition he was the curator for all collected materials (bones, skins, genetic samples, and fruits). His favorite primate is the emperor tamarin and considers this expedition to have been challenging, but a unique learning opportunity for his professional development. Ivan Batista da Silva, Super Guide [Brazil]. Ivan learned how to walk in the forest and search for animals tracks with his father when he was eight years old. He grew up in Mato Grosso state, a region that was strongly devastated during the military government (in the 1970s) in Brazil. Ivan has learned to love the forest, but has also seen it being destroyed around him. Now he is employed by a local NGO that monitors human activities in the last forest remnants in his region. For the past three years, Ivan has been focusing on supporting primate studies as a field guide. He was so excited to work in a continuous forest in search of sakis and all of the other creatures that live in this large rainforest. He was one of our most valuable photographers as his keen eye could find any animal in the forest. Dr. Shayna Whitaker, DVM [USA]. Shayna grew up outside Los Alamos, New Mexico exploring the Jemez Mountains on horseback and motorbike. She is an expert butterfly catcher, having started her career working on a butterfly catching research program with Los Alamos National Lab. Shayna has also plied the Pajarito Plateau for a study of western bluebirds, walked the beaches of South Padre Island in Mexico for a study of the rare Kemps Ridley sea turtles, radio-collared white-tailed deer in Minnesota, and surveyed for monkeys with Dr. Marsh in Ecuador. She now runs a low-cost veterinary clinic in Bloomfield, NM. Thanks to her twin 5- year-old boys, she travelled the rainforest protected by Lego Deadpool. Watch for his appearance on the HBA Instagram and Facebook page. She joined the expedition as an experience field assistant and veterinarian. Leonardo Souza da Silva, Practico and Community Liaison [Brazil]. Leonardo grew up in the countryside of Seringal São Luis on the Rio Liberdade, Amazonas in Brazil. He moved to Eirunepe in 2003 where he now lives with his wife and two-year-old daughter, Lorena. There, he builds custom furniture for Eirunepe’s growing population. He joined the expedition with a vast knowledge and experience of the local area and a detailed map of its waterways in his mind. He served as a multi-purpose field assistant for HBA, often assisting Alejandra with visits to local villages. He was the go-to-guide when the field crew needs to navigate the rivers, igarapé and shortcuts through the flooded forests of the Alto Juruá’s watery transport system. "Sineca," Raimundo Souza das Reis. Sineca is from Jua Grande, an igarapé inside Amanã Reserve outside of Tefé City. He grew up farming manioc, fishing, and learning about the forest from his dad. He says he's never gotten lost in the forest because he always walks with the sun at his back and marks his path with broken branches. Amanã officially became a reserve when he was about eight years old. Sineca feels life for his family improved after this due to an increased abundance of fish and a decrease in illegal fishing by big boats invading their waters from the city. He joined the expedition as an assistant, having worked with researchers from Mamirauá Institute on other projects back home. This trip marked his first time away from home, first time on an airplane, and first time living on an expedition boat. Juan Pablo Bueno Gomez, Filmmaker [Colombia]. Juan Pablo grew up in the city of Bogotá, Columbia. During school vacations, he stayed on the family cattle ranch outside the city with an adjacent forest. There he took care of a baby deer abandoned by its mother and raised a pet squirrel monkey. But he attributes his love of nature and his decision to study biology and environmental engineering to a paddling expedition on the beautiful Magdelana River and his trips around Colombia. He joined the HBA team as the Director of Photography and operated the drone and organized social media. Christina Selby, Independent Journalist [USA]. Christina grew up in Mequon, Wisconsin and spent her summers swimming and fishing at Bass Lake near the family dairy farm in northern Wisconsin. She lives in Santa Fe, New Mexico with her two boys and husband. Whenever possible she heads to the Santa Fe National Forest to find wildflowers or the Gila Wilderness to look for wolves. She has worked as a field assistant scuba diving in Minnesota lakes to collect invasive plants, as a Peace Corps volunteer in a subsistence village in Panama, traveled the length of Central America by bus, and participated in field surveys of pollinators in the Indian Himalayas. She joined the HBA team as an independent journalist and photographer. She quickly learned to navigate the Amazon rainforest and find monkeys in the trees by listening for fruit drops. Marcelo Ismar Santana, Photographer [Brazil]. Marcelo developed a passion for photography at age 14 when his dad gave him his first camera. A self-taught photographer, he served as a field assistant for Luiz Claudio Marigo (a famous Brazilian wildlife photographer) and Sabastião Salgado. He photographed the birds of Brazil for many years and, just when he tired of this subject, met Felipe Ennes on a photography trip to Mamirauá Reserve. The two bonded over their interest in primates and, ever since, Marcelo has been accompanying Felipe on his field expeditions to photograph primates for science. His lifetime goal is to photograph in the wild all 139 species of Amazonian primates. Capitão Elival Pinheiro, Barco Bruno and Rakel Owner [Brazil]. For 29 years, Capitão has sailed his fleet of boats throughout the region where Houseboat Amazon worked. He was very interested in the safety of all who joined the expedition and made sure to hire an excellent crew made up of his brothers and cousins. He did not sail with us, but organized the crew before we left. “Bitito,” Francisco Guimaroes Pinheiro, Comadante [Brazil]. Bitito grew up Seringal Boa Esperanza where his father was the manager of the rubber tappers. From eight to thirteen years of age, he went to Catholic boarding school. When he returned, his family moved to start a cattle ranch in an area that later became an Extractive Reserve. At the time, the Brazilian government required all residents to move out of the reserve once it was legally established. His father has since passed away, and he is still waiting for the compensatory payment the government promised the evicted families. He served as mayor of Seringal São João do Breu for several years before joining his brother in the boat business. Together they have transported groups of people and goods up and down the Juruá river for more than 20 years. He was acting boat captain of the Bruno, master of clearing igarapé of obstacles with a machete, and expert at launching motorized canoes over downed trees so the research team could get to remote places to find monkeys. "Edivaldo," Francisco da Costa Guimarães [Brazil]. Edivaldo grew up in Marechal Thaumaturgo outside of Cruzeiro do Sul and now owns a mechanic repair shop in Seringal do Breu. He's been working with Capitão Elival, his cousin, for 12 years transporting goods and people on the boat. Some of his most memorable trips have been transporting political candidates to remote areas of the Amazon. His favorite forest animals are monkeys. He was excited to learn more about them on this trip and share the information with his daughter who loves animals so much she won't even kill a chicken. He joined the team as the engine mechanic and all around handyman. If any of us needed a nail hammered or a make-shift butterfly net sewn, or a boat engine reconstructed, he was our guy. "Toni," Antonio Guimaraes Pinheiro. Toni grew up in Seringal São João de Breu in the state of Acre, Brazil. He studied to be a priest, but decided to join his brothers Elival and Bitito in the boat transportation business instead. Toni is the proud father of eight grown children who now live in various cities across Brazil. Visiting his children allows him to do what he loves best – travel and see new places. After the four-month expedition, his schedule was packed for the rest of the year moving goods and people up and down the Amazon’s transportation highways on his three boats. "Toín," Antônio Nascimento Martins. Toín was born in Seringal Caipora in the Alto Juruá region. He grew up working in the forest—walking long trails to help his family collect sap from rubber trees. Along their tapping route he encountered just about every animal the researchers on this boat dream of seeing: jaguars, pumas, margays, deer, tapir, curaçao and a wide variety of monkeys. As a young boy, he learned how to hunt alongside his father. His family ate only what they could hunt, grow, and fish. He's been a friend of Capitão Elival since childhood and joined us as the head barco driver. We're pretty sure he's the only one of us that could actually stand up in the very low shower. "Ze," Jose Elpidio de Oliveira. Ze grew up in the small town of Ipixuna, Amazonas, Brazil. When he was eight years old, his family moved to the countryside where he learned to fish and hunt with his father. He has lived in Cruzeiro do Sul for the past six years working aboard a ferry transporting goods on the Juruá and Moa Rivers. He was happy to join this expedition because he enjoys traveling and getting to know new places. Ze was a general crew member for the expedition. In the field, he was the front man in the canoes and kept the team moving in the flooded forest by pulling us over floating logs, under low hanging vines, and maneuvering around sharp corners expertly using the tear-drop shaped paddles as a rudder. Luiz Libermanio Dias Da Silva, Head Cook [Brazil]. Luiz grew up with his family in the Amazonian city of Cruzeiro do Sul. He didn't get to know the forest until he joined the Brazilian Army where he served as jungle boarder patrol and learned his extensive survival and cooking skills. He met Capitão Elival when his army unit was dispatched to support environmental law enforcement along the flooded rivers. After seeing the result of illegal wildlife poaching, he was supportive of the expedition's conservation objective. These days his passion is truck driving, but on the trip he joined us to turn out incredible meals from a kitchen the size of a closet. Dunga," Éderson Aráujo Da Silva, Assistant Cook [Brazil]. Éderson was born in the countryside in Seringal Mirim. He moved to Cruzeiro do Sul when he was seven years old but continued to spend summers in the Seringal, farming and hunting with his family. He still prefers the Seringal to the city. He takes every opportunity to help on his family farm where they grow manioc, watermelon, papaya, and all kinds of vegetables to sell at the market. Éderson feels every experience provides him an opportunity to learn and improve himself. He likes to be in service to people and joined us to help Luiz serve delicious food. The only critique he had about this expedition was that he wished it were longer because it was "optimo!"